Like fine wine, Pu-erh tea can be aged for many years and aged Pu-erh can appreciate in price. However, time is not the only criteria in selecting a good aged Pu-erh. A superior Pu-erh tea always starts with a good quality "raw tea" that is carefully and properly pre-processed, and then aged under optimum storage conditions. The two predominant processes in use are "wet storage" and "dry storage". "I grew up in Hong Kong in the 1960’s when there was only one kind of Pu-erh tea  the dark and earthy Pu-erh that most Cantonese used to accompany their meals at Dim Sum restaurants. Back then, there was no discussion of wet or dry storage. The use of the terms 'wet storage' and 'dry storage' is a rather recent phenomena. Since then, there have been frequent debates over which storage method yields superior tea. So, what is 'wet storage' and what is 'dry storage'? By definition, 'wet storage' refers to a storage environment with high humidity, while 'dry storage' refers to a storage environment with lower humidity. However, the terms encompass a range of variables involving different natural as well as artificial conditions. Therefore, the definitions of these terms are less than clear cut. According to my tea master, Mr. Vesper Chan, at the start of Hong Kong’s economic growth in the 60’s and 70’s, factory buildings built along the harbor in Hong Kong Island all had basements. As these buildings were near hillside and the harbor, their basements were very humid, especially during the rainy seasons. Tea vendors and dim sum house owners discovered that the naturally moist environment was very conducive to enhancing the fermentation of Pu-erh tea. Consequently, these basements became popular tea warehouses and most Pu-erh produced during this era was stored in these naturally humid environments. The term 'dry storage' was first introduced when Tea Master Chan stored a batch of 1988 Menghai 7542 in his warehouse on the 10th floor of a high rise building instead of in a basement. Aside from the usual humidity fluctuations of the Hong Kong weather, this batch of tea cakes was aged naturally without any human manipulation. By the mid-2000’s, this tea cake gained great popularity in Hong Kong, Taiwan and China and Tea Master Chan named it '88 Raw Cake' (Baba Qing Beeng) to commemorate the year he started his tea business (1988). Furthermore, eight is an auspicious number in the Chinese culture. Tea Master Chan and many 88 Raw Cake lovers attributed the beauty of the 88 Raw Cake to the natural dry-storage aging this cake underwent and its popularity has since created a new trend of Pu-erh storage. Since then, Pu-erh consumers pay close attention to how a Pu-erh cake is being stored and many have strong opinions as to which storage method would yield a superior outcome. Proponents of the wet storage method would argue that the highly revered master-piece tea cakes were all stored using the traditional wet storage method, and thus, one should not have doubts about tea stored in this manner. They also argue that humidity is an important ingredient for fermentation. Proponents of the dry storage method would argue that storing the tea in a dry environment enables the tea to retain its original aroma and basic characteristics. Furthermore, the highly humid environment is likely to alter the flavors of a tea and could leave an unpleasant 'wet' odor. One advantage of using the wet storage method is the shortening of the aging time. The tea can achieve the aged taste and reduced the bitterness in a relatively shorter period than if the tea were to be stored in dry condition. Many Pu-erh lovers enjoy this unique aged flavor. In reality, many tea masters use a combination of wet and dry storage to achieve a desired outcome. One problem with wet storage is that in recent years some unethical tea vendors, wanting to make a quick profit, intentionally manipulate the fermentation of the tea by adding excessive humidity to the storage environment, thereby forcing the tea to ferment quickly and selling it as an aged tea. Sometimes the humidity is so excessive that causes molds to form on the leaves. Others teas produced in this manner possess a musty odor that is so over powering that the original fragrance of the tea is totally lost. We can all agree that such practice is ill-considered and should not be confused with the traditional natural wet storage practices. In conclusion, storage conditions are one of many variables, albeit an important one, that affect the quality of a Pu-erh tea. Whether a tea is 'good' also depends very much on personal preference. 'Dry' and 'wet' storage are general labels that often do not explain the specific conditions under which the tea is being aged and stored. Therefore, we should not base our purchase decisions on these terms and labels. Rather, we should evaluate a tea by its overall quality, which is always reflective of the merits of the original raw tea, and the care given during production, including the time it was harvested, its processing and its aging." Your Pu-erh tea should not be exposed to excessive humidity for prolonged periods of time or its taste can become flat and dull. During the season when humidity is very high, opening the window to allow fresh air in the room is advisable. 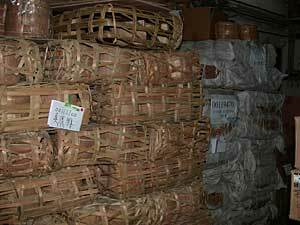 Pu-erh tea should be stored well above ground level and be given good ventilation. If you have a large amount of tea, it should be rotated once every six months to even out the tea's exposure to fresh air. Extreme variations in temperature should be avoided. Pu-erh tea has a tendency to absorb odors in the environment. Avoid storing your Pu-erh tea in kitchen cabinets or near moth balls or around other items that emit strong odors. With regard to the appropriateness of using a humidifier in places with low humidity, Master Chan opined that it would be fine to use one a few hours once a month to promote faster fermentation. Lastly, if you are storing a variety of Pu-erhs, always store the raw Pu-erh and the ripe Pu-erh separately in order for the respective teas to retain their own unique aroma. Some cakes, such as those in the form of bricks or tuo cha, are very tightly compressed and you may experience some difficulties to loosening the leaves. The Pu-erh pick is probably the most functional instrument to loosen the leaves. However, it is very sharp and extreme caution should be exercised when using it.